Looking for a team of building specialists from the Bromley area? We are PML Construction Ltd, leading the way in affordable and reliable building companies in Bromley. All aspects of building work undertaken at competitive prices. PML Construction rapidly established it self with the majority of our contracts being in London and the surrounding boroughs undertaking both residential and commercial work contracts with our portfolio of clients ranging from landlords, private clients, leading estate and managment agents to various surveyors and other building associations. All of which we strive to provide a proffesional, affordable prompt resonse to their requirments whilst not compromising on our highest quality finish and service. We specialise in all aspects of the building trade and particulary pride ourselves in the roofing division as we chose to excel ourselves in this area. Let us help you transform your living space and realise the potential of your property!! PML Construction Ltd is a building/property maintenence company. Having gained the experience with all client types and completed a range of high quality projects we are becoming well know and trusted as one of the best in the business. We pride ourselves on the excellence of our work, our reliabily and promptness of service. PML Construction doesnt just provide a wide range of roofing/building services we can also provide project management and design. We also have a property management service with a secure key holding option for private landlords, the benefit of this is our clients peace of mind. If out of town and somthing went wrong be it a burst pipe or leaking roof we would be on hand to deal with the problem promptly and professionally. Rising damp / condensation & Timber Treatment Specialists. Structural maintenance – refurbishments, extensions, loft conversions, waterproofing, bricklaying/paving, carpentry, decorating, plastering, windows/doors. Heating & Plumbing & Electrical & Lighting. So if you're looking for a property maintenance, roofing & building company in Bromley with many years experience in the building trade then look no further than PML Construction Ltd. Whether it’s a query or a quote, pick up the phone and call 07903846590 today or visit our contact page or send us an email. We are located in Bromley, Bromley and cover the wider area. For more information, contact us on 07903846590 and we will gladly answer any questions you may have. 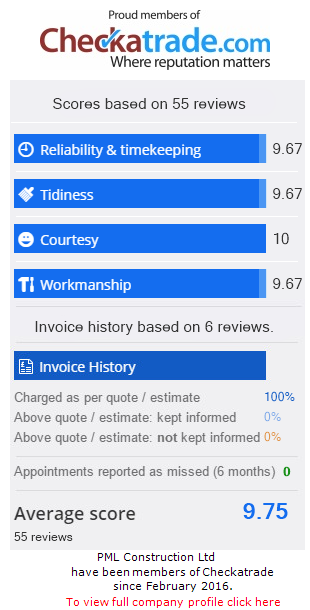 Our mission is to provide the residents of Bromley with a no hassle building service where all work exceeds expectations, meets deadlines and offers excellent value for money. We work very closely with our clients to ensure complete customer satisfaction.